President Obama on Friday evening formally ordered what he characterized earlier in the day as a "series of dumb, arbitrary cuts." Known officially as sequestration, the president's order canceled $85 billion in federal funding over the next seven months. As required, the White House budget office also sent to Congress a report detailing the magnitude of cuts that federal agencies will have to make. In aggregate, defense spending must be cut by 13% over the next seven months and nondefense programs must be cut by 9%. Those percentage cuts will apply to all non-exempt programs, projects and activities. In dollars, the spending reduction must be split evenly between defense and nondefense -- as a result, each category will lose nearly $43 billion in funding. Some key areas of spending will be protected from the budget ax -- most notably military personnel, Medicare and Social Security benefits, as well as Medicaid and food stamps. The funding reductions would come primarily from what's known as discretionary accounts, which make up the smallest part of the overall federal budget, accounting for a little over a third of all spending. Discretionary spending supports a vast array of federal agencies from the FBI to the FDA to the National Transportation Safety Board, as well as education programs across the country. The actual dollars cut from these and other areas varies widely since their normal funding levels do as well. Navy operations and maintenance, for instance, will take a nearly $3.5 billion hit. National Science Foundation research funding will drop $290 million. The Nuclear Regulatory Commission will lose $52 million. And the Affordable Housing Program will see its budget cut by $10 million. Few would dispute Obama's characterization of the cuts. In fact, it's one of the few things about the so-called sequester that Democrats and Republicans agree on. They failed to agree on how to replace them, however. Both chambers of Congress passed the sequester as part of the deal that put an end to the ugly fight over the debt ceiling in 2011. The cuts were designed to be so distasteful that they would spur lawmakers to approve a smarter approach to deficit reduction. But they've failed to do so. The cuts will result in many if not most federal workers furloughed for some period of time. And federal contracts and grants will be curtailed or not renewed. That, in turn, will create delays in services, travel hassles, less border security, fewer food inspections, interrupted medical research and less disposable income that has buoyed local communities. Such ramifications will deliver a blow to economic growth, but not a fatal one -- a point the president acknowledged Friday. "Even with these cuts in place, folks all across this country will work hard to make sure that we keep the recovery going. 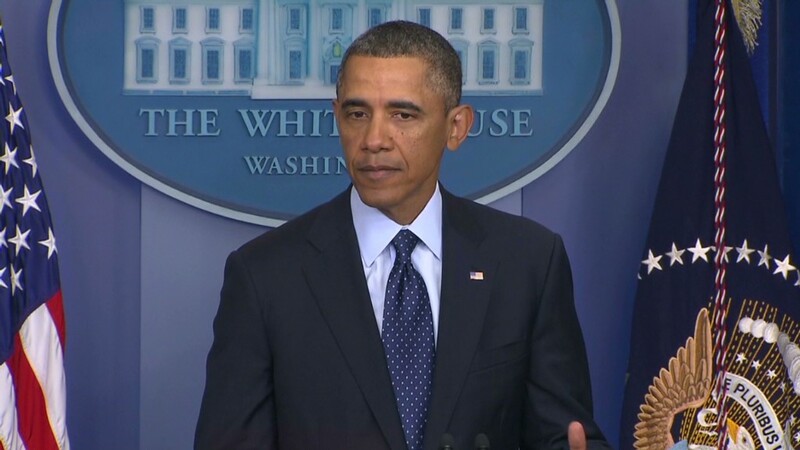 But Washington sure isn't making it easy," Obama said. Congress will get another chance to forge an agreement over replacing the cuts this month, as lawmakers duke it out over spending levels for the rest of this fiscal year. They have until March 27 to approve a new funding bill. If they don't, the government will shut down, with the exception of essential services. If they succeed in replacing the cuts by then, the disruption caused by the sequester may be limited, since its ramifications will unfold over several months as opposed to a few weeks.